If you are looking for a fun, engaging game for your kindergarten or beginning first grade students, to help them with blending, segmenting, sound substitution and rhyming, look no further! 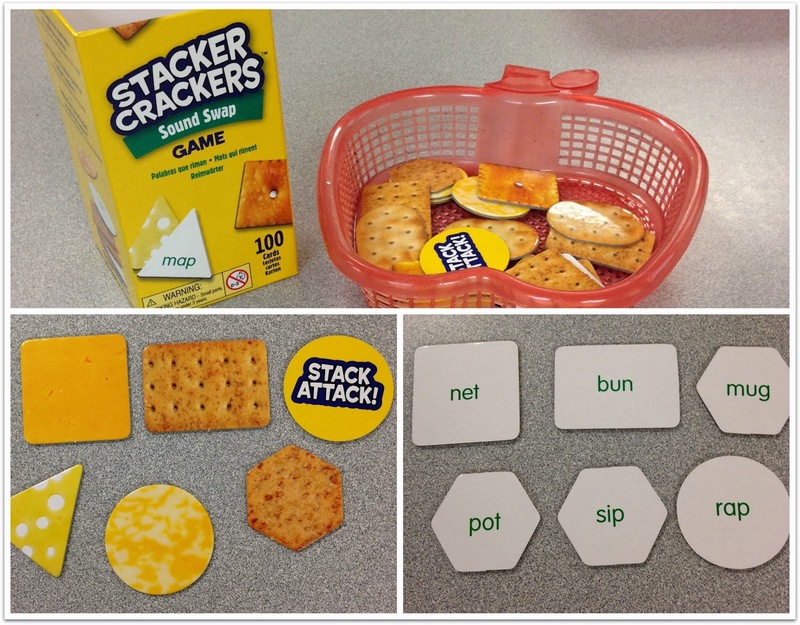 This delicious game is called Stacker Crackers and is made by Learning Resources. Recently, I had the pleasure of reviewing this game with my kindergarten students. I played too and we all had a blast! 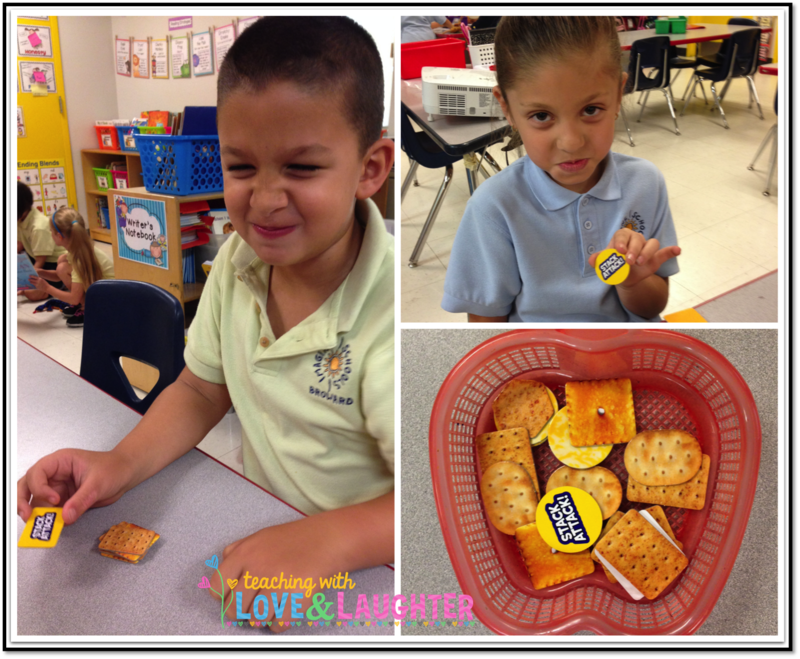 Not only is this game fun, but it also makes you crave cheese and crackers! To play the game, students choose a card out of the box (without looking) and read the CVC word out loud and show the group. Then, they replace one of the sounds with a different sound to make a new word. The first several times we played, the children replaced the first sound. For example, if they chose a card with the word net, they can say set. Most of the children were able to come up with their own new word, but sometimes I gave a hint, like, change "nnnn" to "ssss". This way of playing the game is great for students who need to practice rhyming. We also played the game by changing the last sound. If the children say a new word correctly, they get to keep their cheese or cracker. If they don't, it goes in the discard pile. I used a basket to hold the discards. The object of the game is to earn as many cards as you can and make a stack of them. But you can't play with your stack because if your stack falls down, you must put all your cards in the discard pile. Remember the STACK ATTACK card? Getting one of those is a bummer because that means you have to put your whole stack into the discard pile! These two cuties were NOT happy about that! Neither was I! I think I chose the most STACK ATTACK cards of all my students! I didn't win one game! And I played a lot of games! 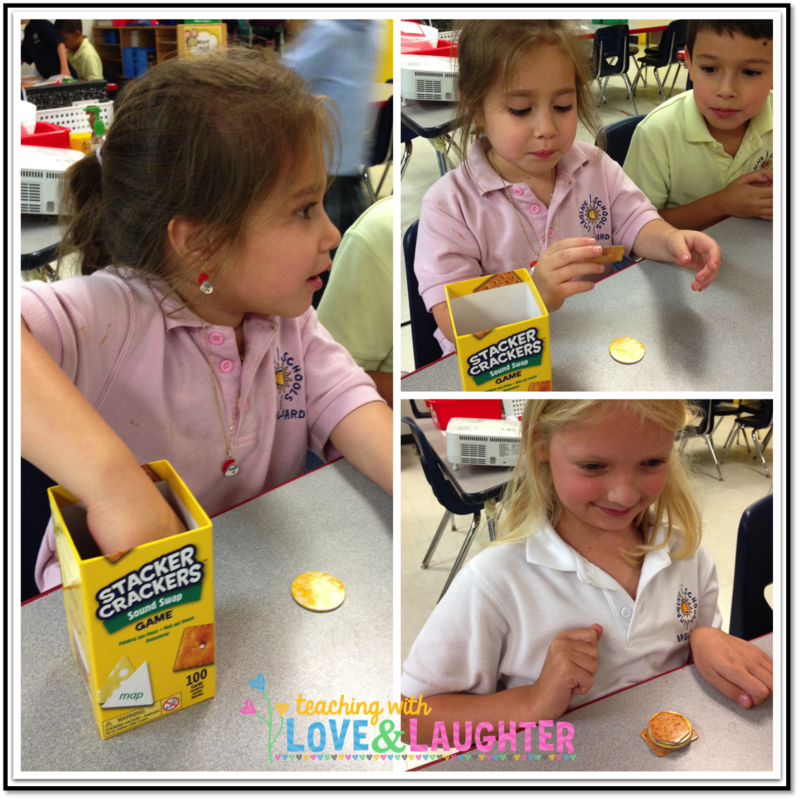 Stacker Crackers is a GREAT game and I highly recommend it for every kindergarten and first grade classroom. It is best played in a small group, like at a station or during a reading group. Once every child played the game a few times, they were able to play it independently at the Word Work Station. This game is one of the most popular learning games in my classroom. I promise you your students will love this game too! And, I bet you'll be eating way more cheese and crackers than you have ever eaten before! 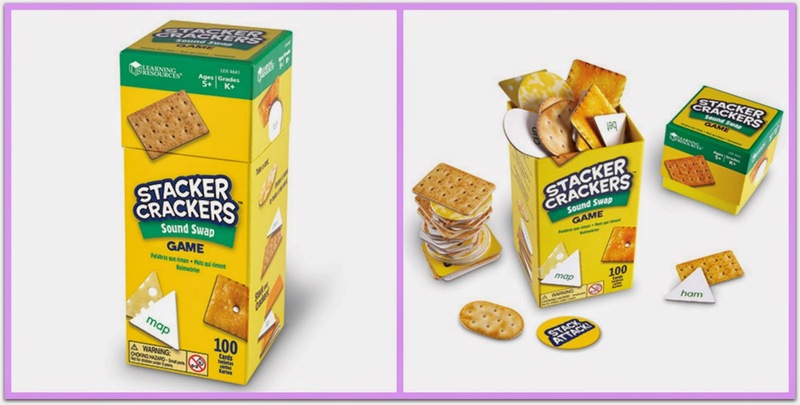 Learning Resources is kind enough to allow me to give away a Stacker Crackers Sound Swap game to one of my lucky followers. Just fill out the rafflecopter below and cross your fingers. As always, there are many ways to enter this giveaway. The more you choose, the higher your chances are of winning. Please enter with integrity. All entries will be verified. 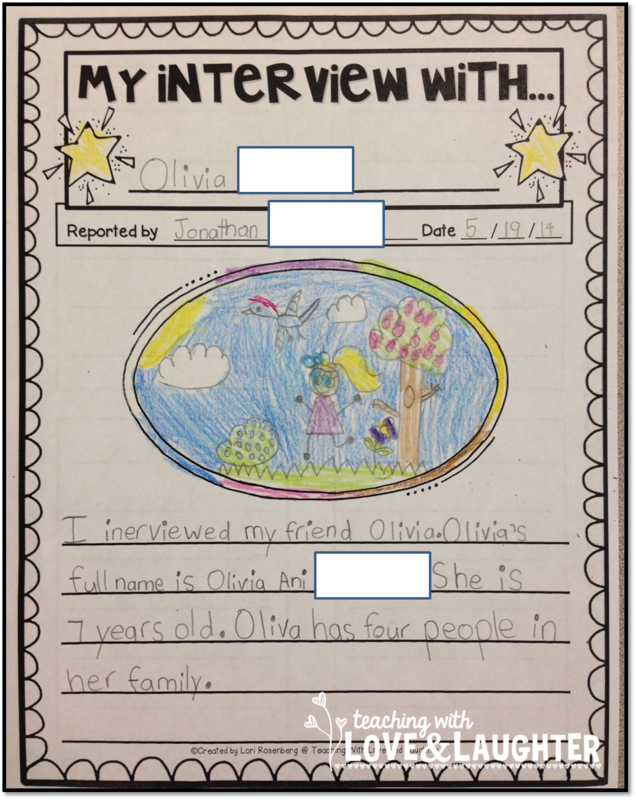 One of my favorite writing activities is when the children interview each other. 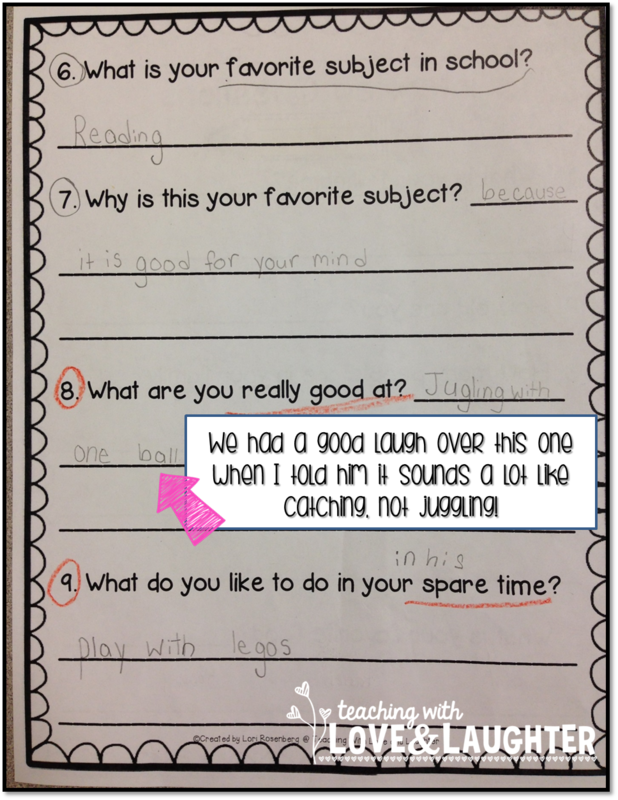 They learn so much about asking and answering questions, keeping it relevant, sentence structure, working collaboratively, and so on and so on. There is never any complaining about all the hard work that goes into planning, drafting, and publishing an interview piece. First, the children are assigned random partners. Then, they ask each other questions and record their answers. Me: Juggling with one ball? Sounds a lot like throwing up a ball and catching it. Jonathan: Yeah, it is. It's kind of boring, but I'm really good at it! LOL! 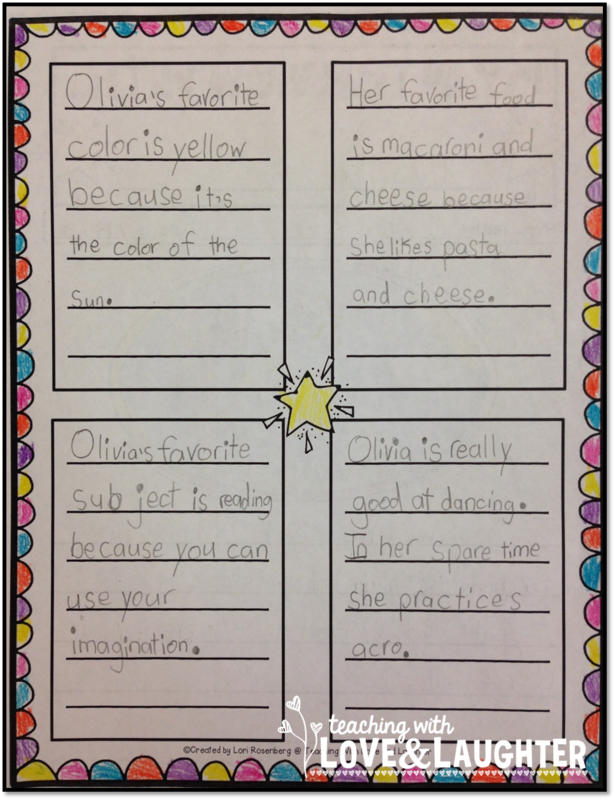 I love when children think outside the box! Then each student meets with me and we fix some of the errors. Finally, they are given the final writing template and they publish their interviews. "Likes to fit in small spaces!" 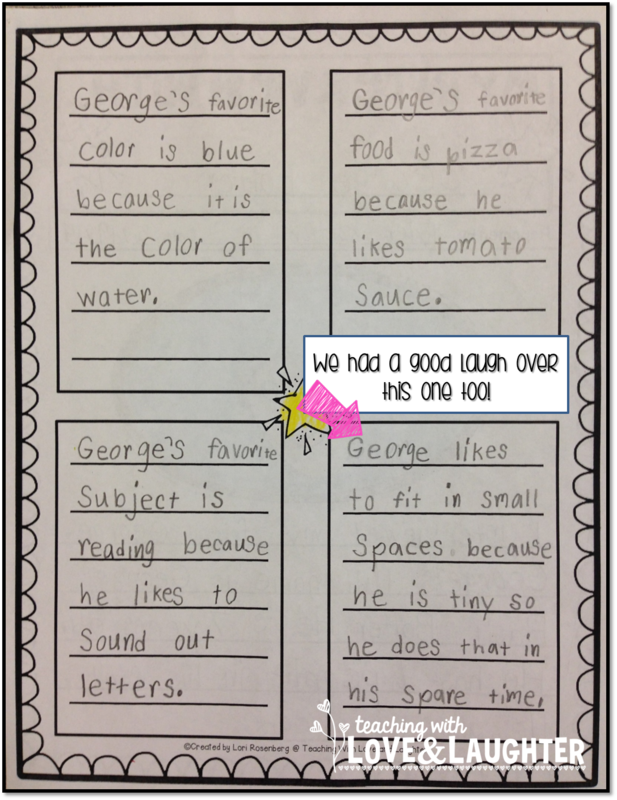 Love the creativity in George's answer! 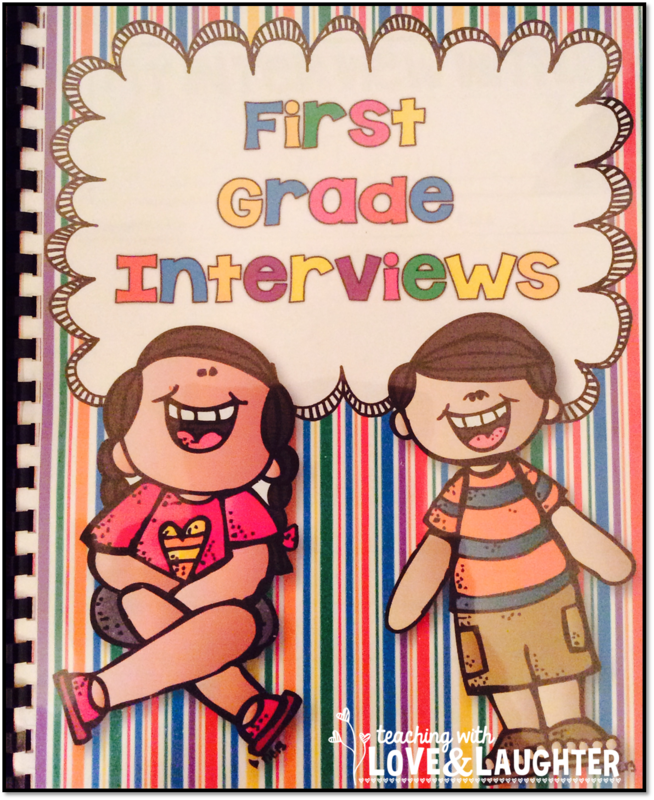 Once all the interviews are written, I bind them into a book and it becomes our newest favorite book to read. 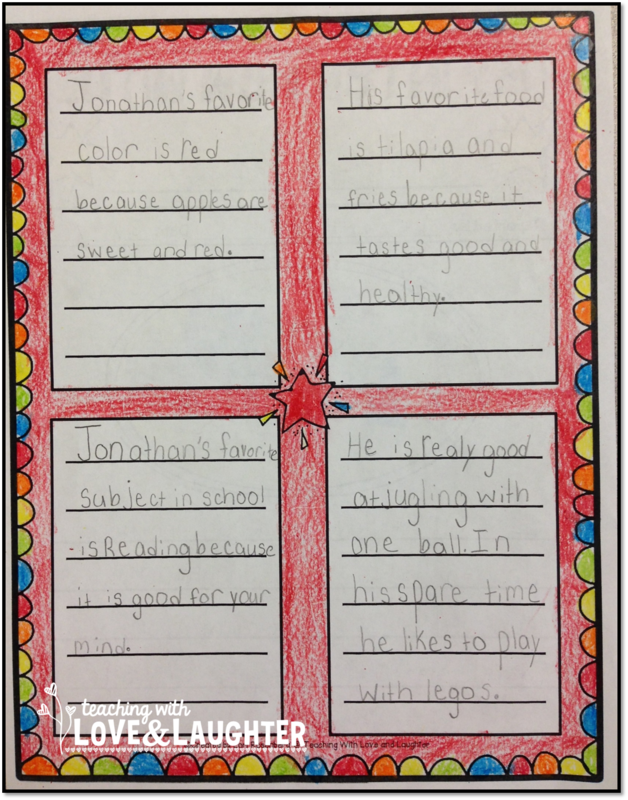 Students whose siblings have been in my class love to read all about their brothers and sisters. 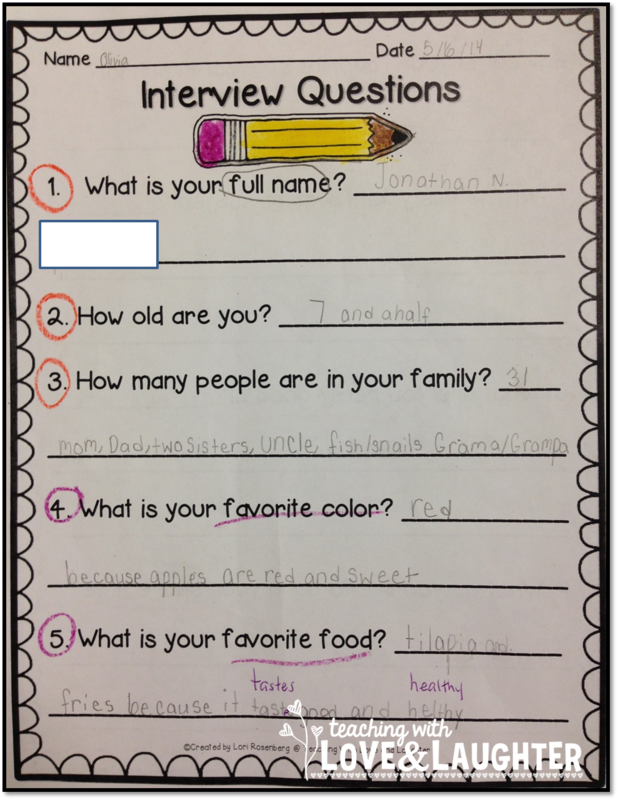 If you would like to have your students conduct interviews, you can find the interview question sheet here. It's part of my writing station activities. 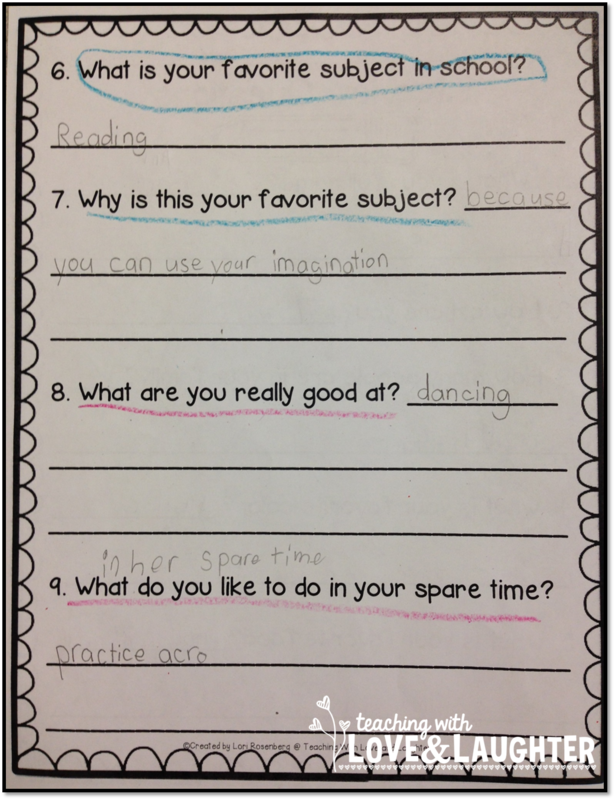 This pack includes question sheets that are very basic, for beginning writers. 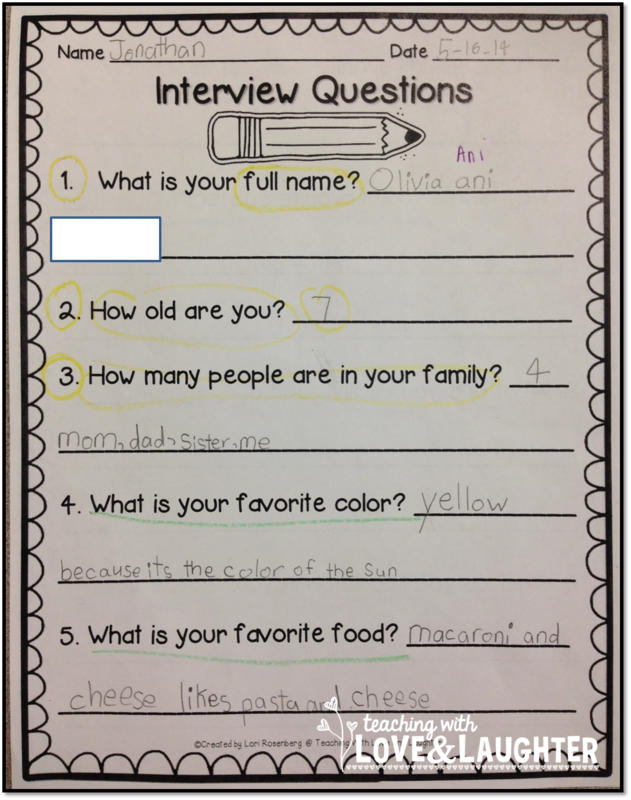 Next week, my kindergartners will be conducting interviews too. 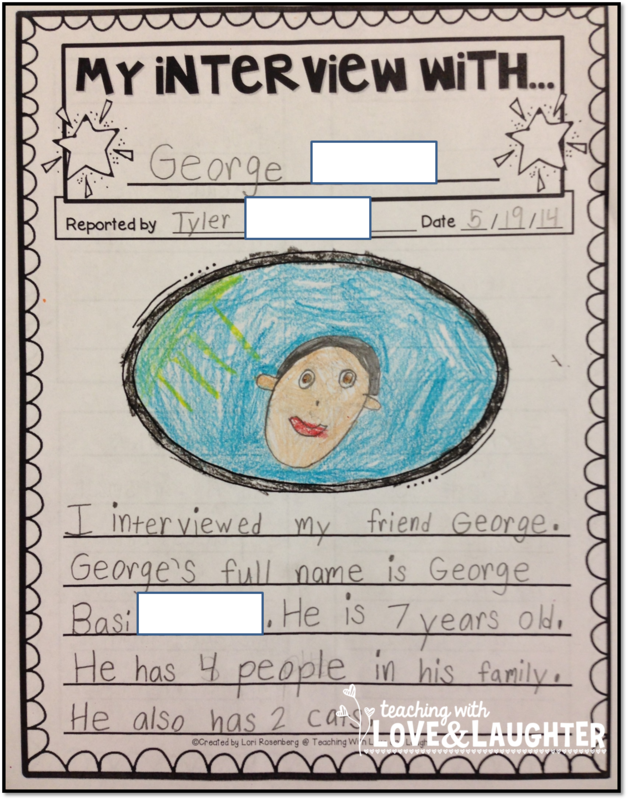 And you can find the interview writing templates here. 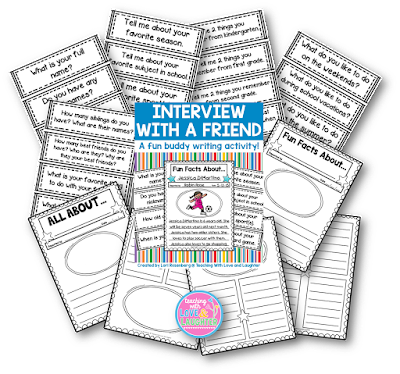 This second pack allows you to choose the questions the children ask each other and comes with 96 different questions and 6 different writing templates. 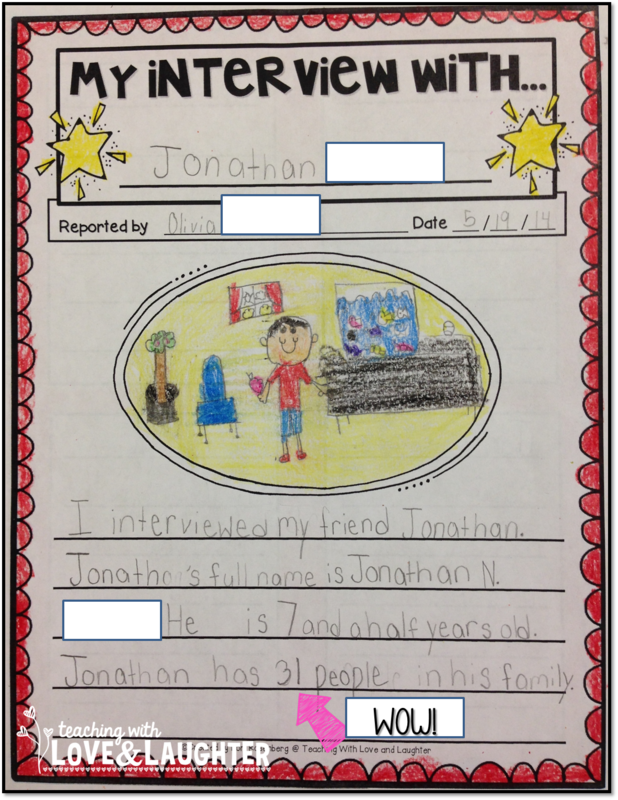 I hope you decided to give interviews a try! 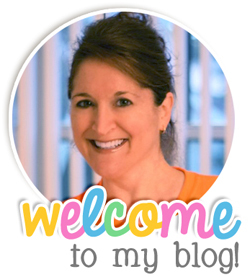 Bright Ideas Blog Hop! Packing up for the summer! 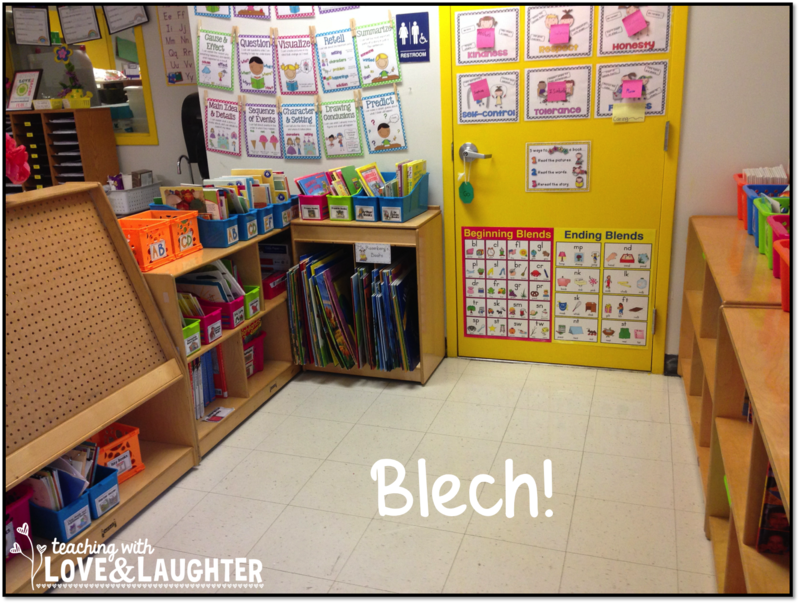 Do you have to pack up your classroom for the summer so your school can clean, wax, paint, etc? Don't waste paper to cover your furniture! I bought a large stock of tablecloths at the end of the holiday season a few years ago for next to nothing. Each year, I cover my furniture, with all my stuff safely tucked away inside. 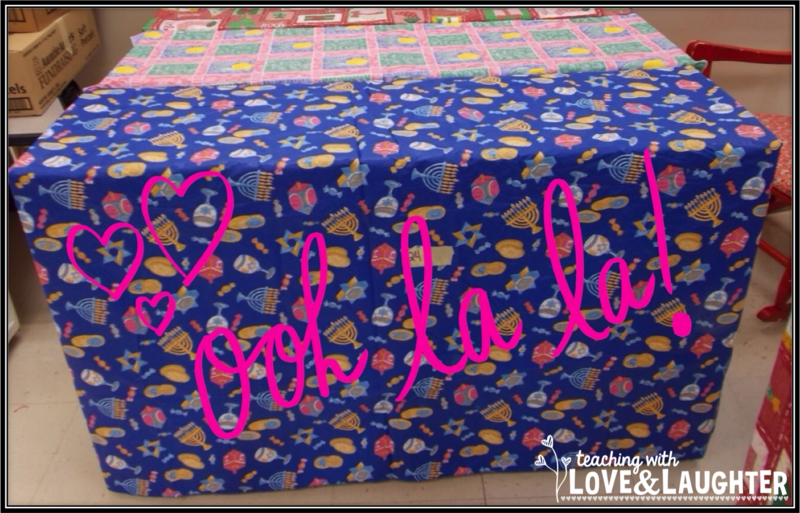 When I am ready to set up my room, I just whip off the tablecloths, fold them up, and store them until I need them again. Easy peasy! No wasting paper! And, it looks quite festive in my classroom! 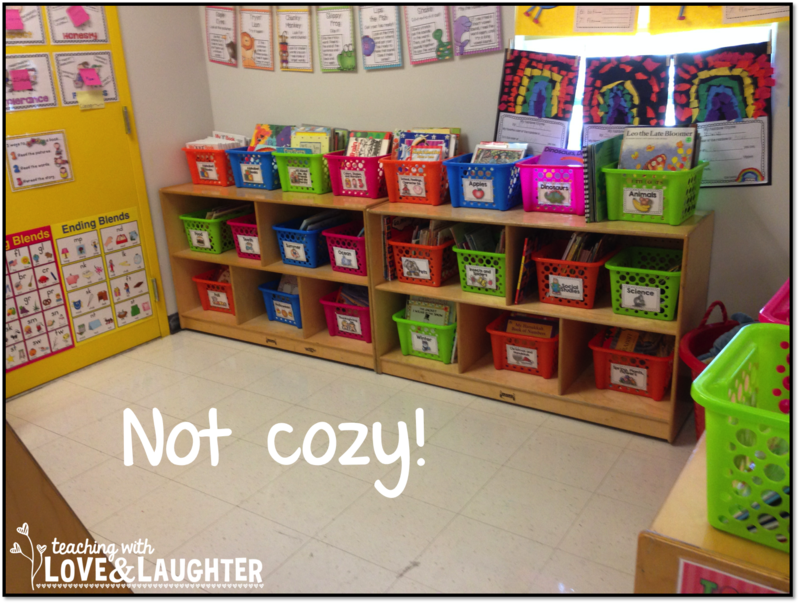 Here is my classroom library. It used to have a nice carpet in there, but I had to remove it because it didn't meet our fire code requirements. I have a nice big library area, but it just isn't very cozy. I have been wanting a new carpet that is up to code, ever since my last one went bye-bye. Well, recently, my prayers were answered when I was contacted by Jim Banks, owner and founder of KidCarpet.com. He offered me the chance of a lifetime! He said I could look through his large selection of beautiful, colorful, and up to code carpets, and choose one for my classroom. In return, I promised to write an honest review of how I feel about the carpet. It took me a long time to figure out which carpet I would like. I was tempted to get a large 7'6"x12' carpet, but since I already have a decent one, I decided to go for a smaller carpet for my poor library area. 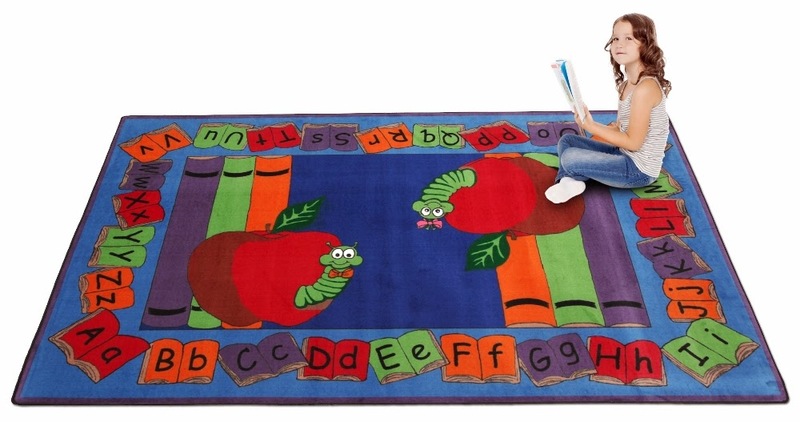 There are tons of different carpets to choose from and I finally decided on the Let's Book It Story Rug because it is perfect for a classroom library. My carpet arrived in 3 days. Really! I am not kidding! In a matter of minutes, I had it set up and my students were so excited to try it out. 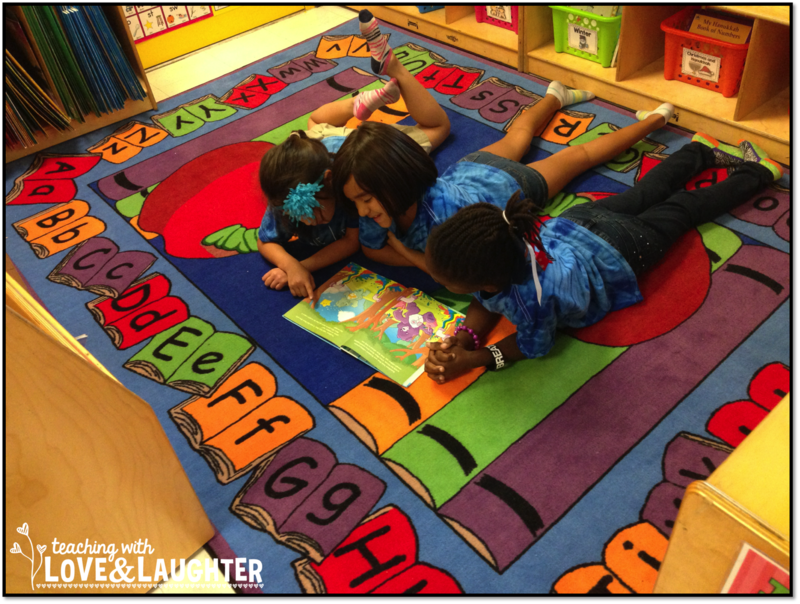 They were so happy and content to sit and read on our beautiful new carpet. We all decided it would be best to take our shoes off so we don't get it dirty. 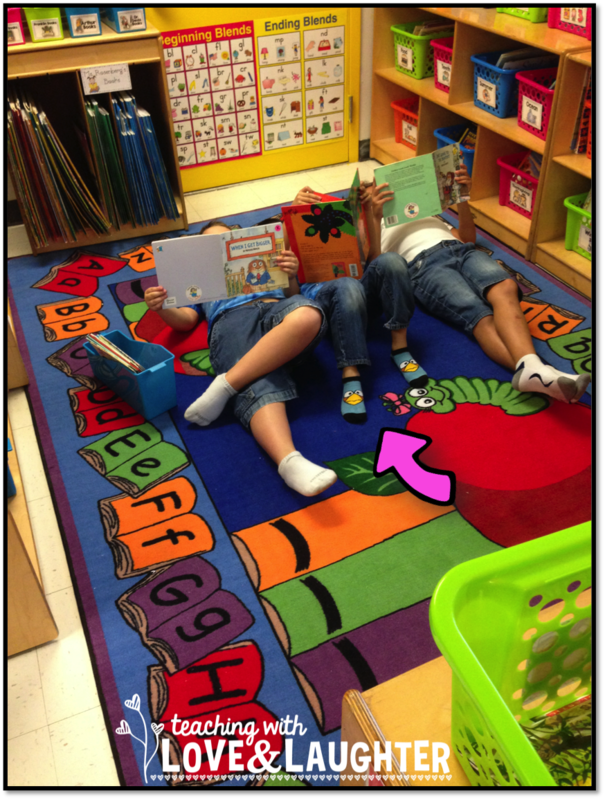 My students and I give our new carpet an A+! It is pretty, comfy, durable, up to code, and we couldn't be happier with the new addition to our classroom. 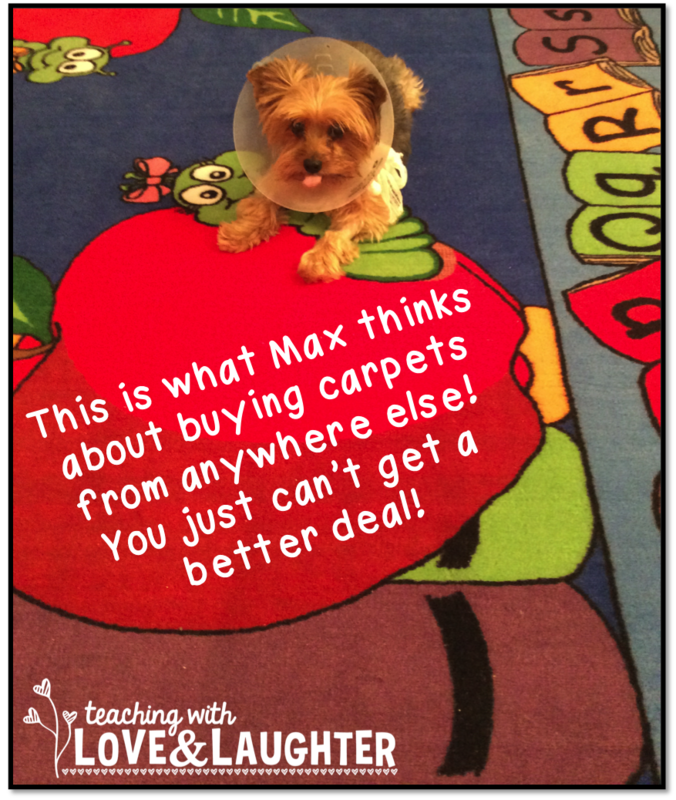 Max is a very tough critic, but, as you can see, he gives this rug 2 paws up! My students and I (and Max!) 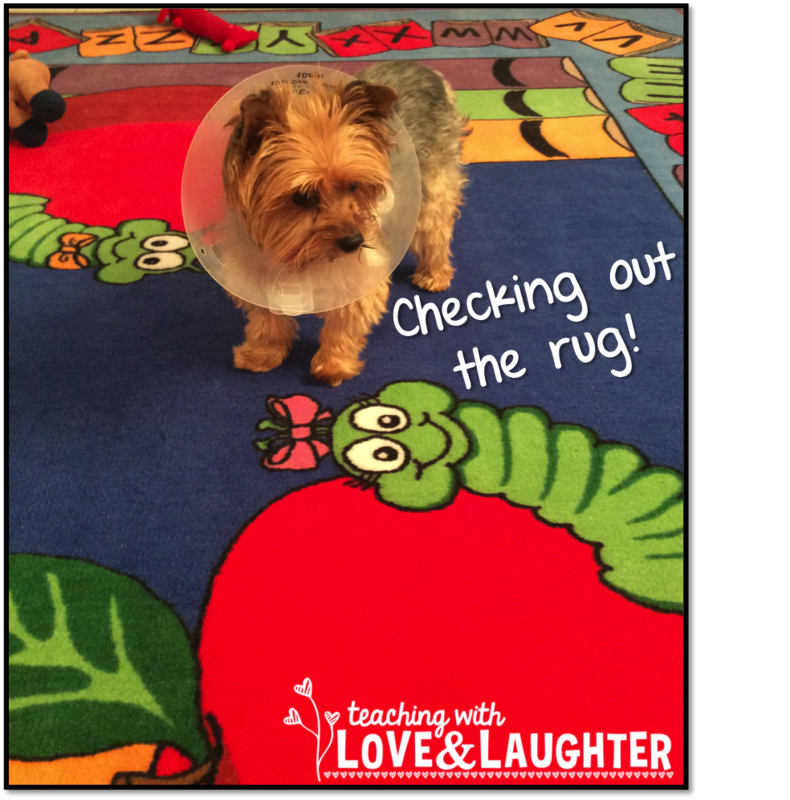 are very grateful to have been given the chance to get a new classroom carpet and I am extremely happy to announce that generous Jim is giving one of my lucky followers a chance to win a FREE carpet of your very own for your classroom! The lucky winner can choose any rug that is 7'6"x12' or smaller. This prize is valued at $279! This giveaway is only open to educators in the continental United States, since it is too costly to ship outside of the USA. Please do not enter if you do not live in the United States of America. Please tell your colleagues about this contest and share it on as many social media sights as you can. I really want to help spread the word about KidCarpet.com. They are the only "place on the planet where you can buy direct from the factory". 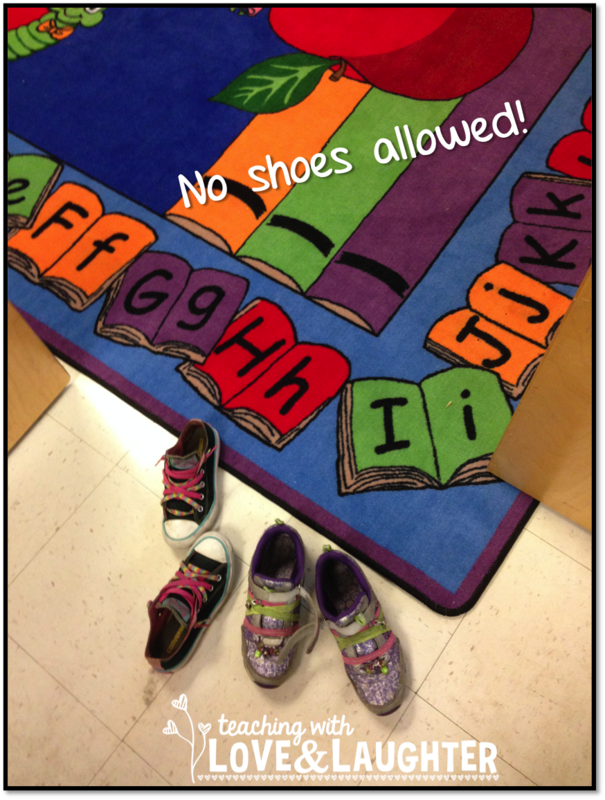 Because of this, they offer HUGE savings on classroom rugs and carpets. They even offer 3-4 day shipping on select carpets. 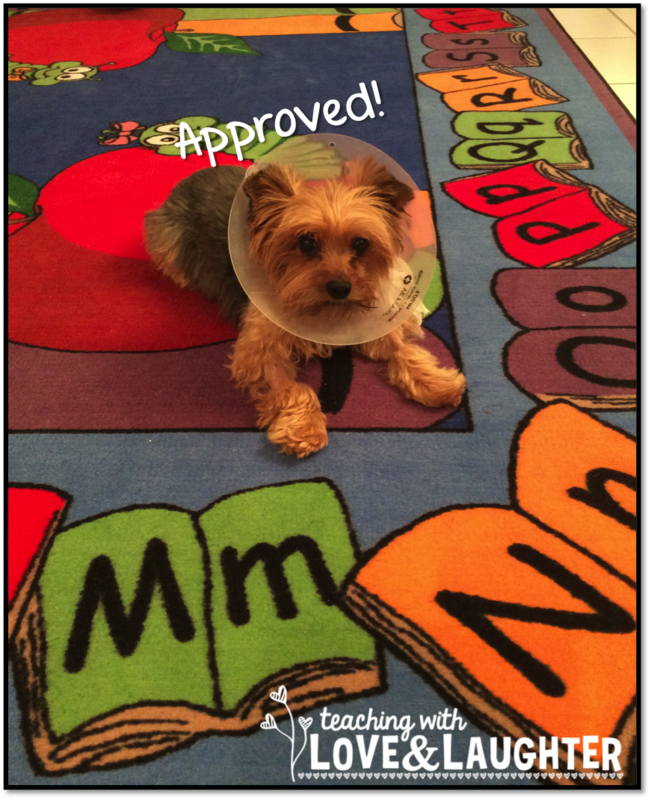 Phoneme Substitution and Teacher Appreciation Sale! Phoneme substitution has proven to be quite challenging for my kindergartners. We play a quick oral substitution game every day, but I still see some students taking a bit longer to come up with the right answer. 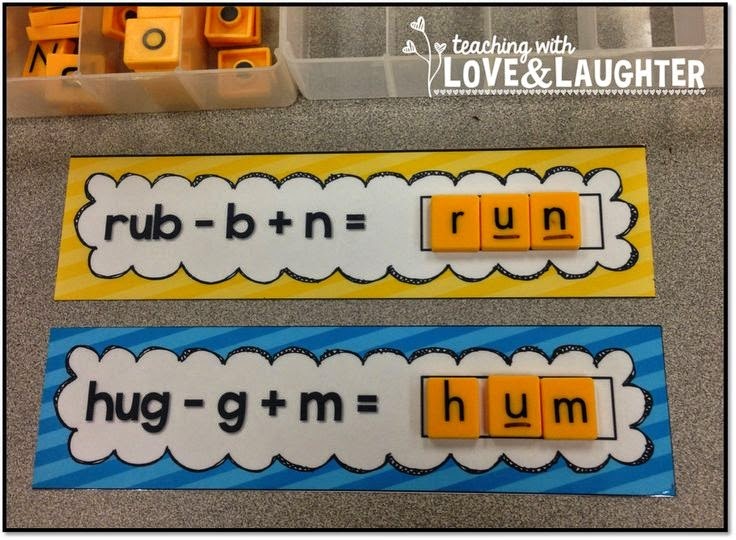 So, I made these phoneme substitution cards for my word work station. Students can practice this skill on their own during station time. 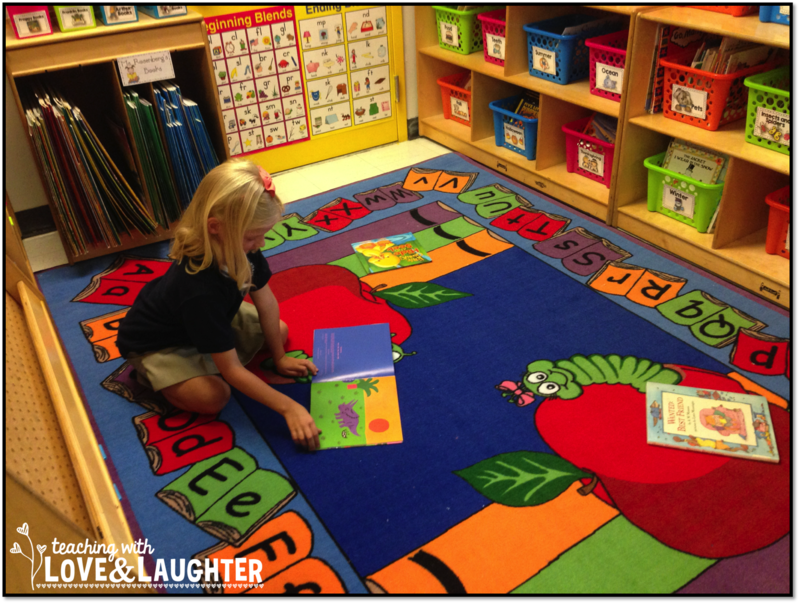 Students read each card like a word problem and solve it on the mat. I laminated the cards so they could write on them with dry erase, but they also have the choice of using letter tiles or beads. 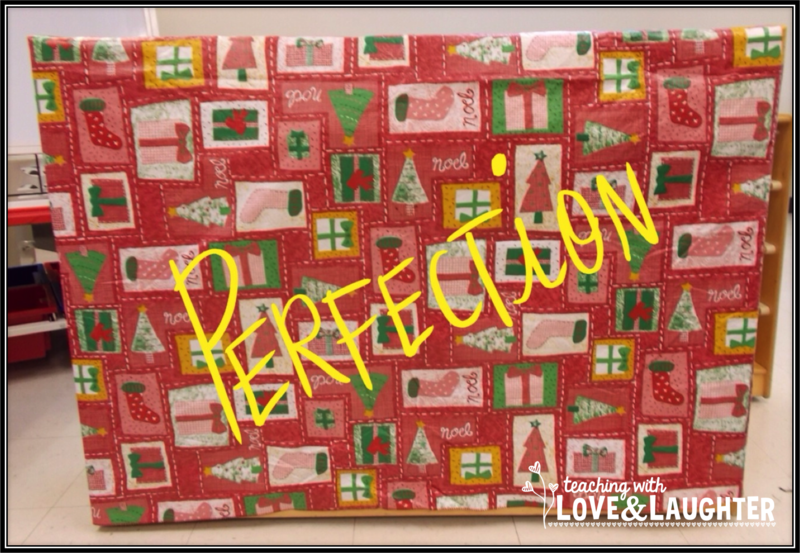 This fun activity has proved to be VERY helpful in practicing this skill. I made 51 cards for substituting initial sounds, 75 cards for medial sounds, and 54 cards for final sounds, for a total of 180 cards! That's a lot of practicing! In other news, my entire teaching store will be 20% off May 6-7 in honor of Teacher Appreciation Week! Just click the button above to start shopping! Don't forget to use the code TPTXO when you check out to save another 10%! I hope you have a very special Teacher Appreciation Week! Breakfast, chocolates, gift cards, and lots of sweet sentiments!